Shifter mechanisms are one of those things that everyone takes for granted until they get used, like its an after-thought. There are bar-ends, triggers, twisties, brifters, and maybe a few other obscure devices. Most are cable operated, although some of the newer ways to pry dollars from the biker's wallet are fully electronic. The goal is for the rider to reliably and comfortably shift ratios, but not everyone has the same shifter needs. Shifters are a personal thing. Riders don't reach down and manually change gears, their fingers have to reach the shifter, and move it. Simple as that sounds a rider with short fingers has different needs then a rider with long fingers. Some shifters take a bit of effort, some require combined motions such as fingers & wrist. 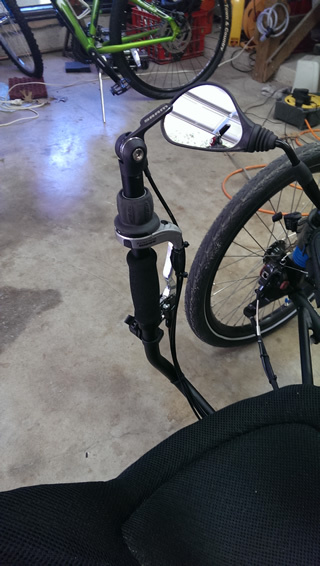 Many riders buying their first trike soon realize the shifter it came with isn't what they really wanted. Despite wide variety of shifters they need to be compatable with the derialleur/transmission system. Depending on the manufacturer and number of gears each has a varying amount of Cable Pull. Some have many options, some only have one option. Each shift takes a precise distance of pull on the cable. Cable Pull precision is vital on rear deraileurs and Internal Gear Hubs. Most systems with 8 or more gears have indexed "click" points on the shifter designed to accurately provide cable travel. There are no real standards among the suppliers for cable pull so we've put together a matrix on those which are commonly used by trikes.